After many months of planning and problems we are nearly there. The rest of the milk equipment is finally on its way. John collected the bottle filler last week and there is now just the pasteuriser and separator to come, both scheduled for delivery this week. 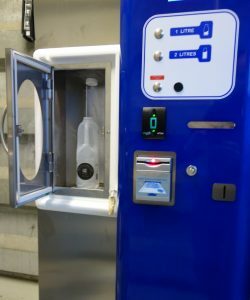 Most of our equipment is refurbished and the bottle filler came from a lovely farm where they sell raw Jersey milk to the north east of London. They have swapped to a vending machine from selling pre-filled bottles. We need a bottle filler because we are planning to sell both. Bottles are ordered, labels being designed and the vending machine being built. The vending shop space will be finished at the end of the week. Still some weeks of fitting, calibration and food safety testing, but the light can be seen at the end of the tunnel. 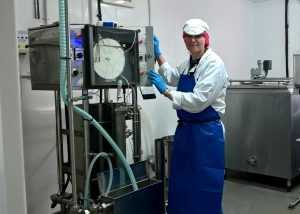 Then we can start making cheese with the pasteurised milk too. 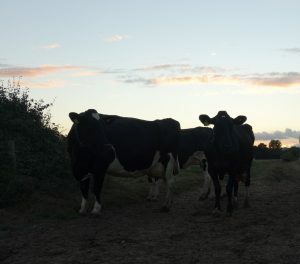 On the farm, the cows are enjoying being tucked up for the night. We have been sowing grass seed to rotate some of the fields and are now desperate for some decent rain to help it germinate, but it looks like the fine weather is going to be with us for a little longer. That’s the downside of farming in one of the driest parts of the country. 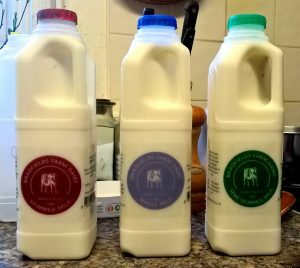 As well as the excitement of the milk kit finally arriving we should be getting the first milk price rise at the end of this month after about 2 years of cuts. The current market price is going back up but it takes a while to filter through to many farmers and we are still at the lowest prices for years. A penny rise for the end of October and another penny promised for November. Still a long way off the breakeven point but a positive step in the right direction if the trend continues. We thought summer was nearly here last week but then we all got a little bit soggy again. My sister had an even earlier start than usual to check our girls were ok in the thunder (she is normally up at 3.30am every day to milk the cows). Whilst they like to be out normally they were huddled under the trees and keen to keep dry but they were all fine, which is more than can be said for Piglet the terrier who definitely does not like Mr Bang coming. 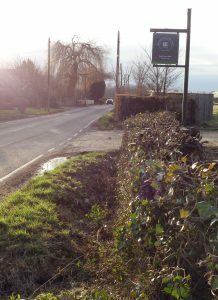 We had more delights of urban fringe farming and a second big bang of the week with a car crashing through the gates into the horse field and being abandoned, with a very quick police response removing it as it appears to have been a robbery getaway vehicle. Horses merely ignored all this and walked back to the stable paddock. Once the fencing was repaired the rain has meant a bit of time for indoor work and things have moved on in milk room. The two tanks for full fat and skimmed milk have been installed, the plumbing is in, the piping to transfer fresh milk from the parlour tank is all in place and the mini shop space conversion has begun and the door hung. In the meantime we had our cheese consultant visit to see how we are getting on. 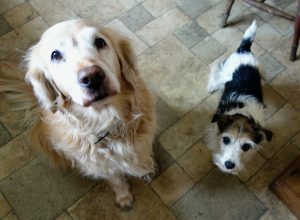 He liked the cheeses we have been trialling and gave us some advice on fine tuning the recipes over the next couple of months. Starting yesterday we have the first new batch of Chalvedon made, we are tweaking the temperature and brine levels. We will be trying it in 10 days and then maturing it for 1, 2 and 3 months to see any differences. The rest of the milk equipment is (fingers crossed) still on schedule to be installed in July. It has been quite a fortnight of firsts for the us and our new dairy. 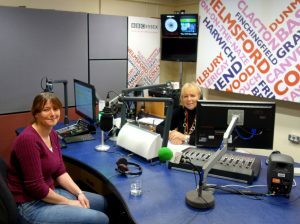 About a week ago we had a radio interview with Peter Holmes from BBC Essex. 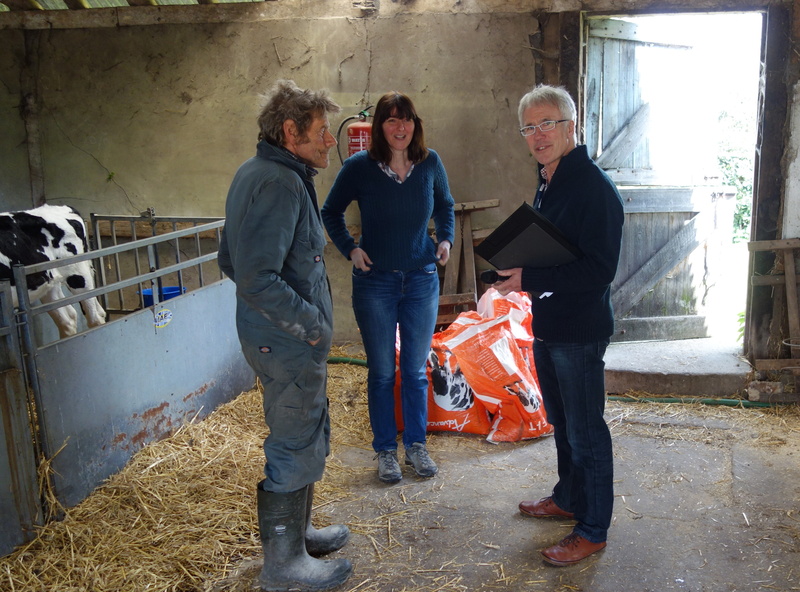 He wanted to talk to us about the dairy crisis and our plans for making cheese. We took the plunge and said we would do our first interview with great trepidation. Speaking in public is not really my forte. Peter was great and it wasn’t quite as scary as I thought it would be and we were expecting a small piece on his show today. Completely taken aback by the fantastic coverage he gave us, including announcing our new cheese in the opening news. Not what we were expecting to hear but great that he was a keen on talking about cheese as we are. 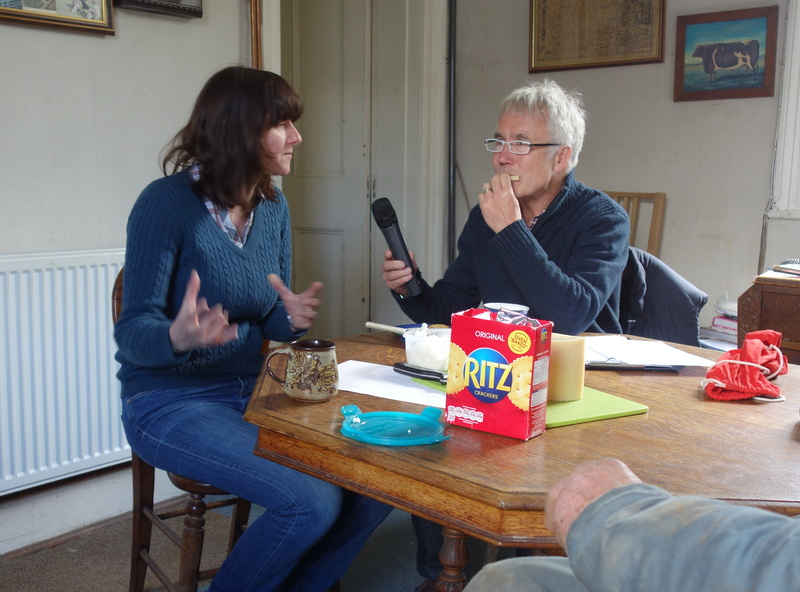 We are waiting to hear all the suggestions from listeners on what we should name our new soft cheese, we heard a few suggestions on air including Bradfields Spread, Yessex and Essex Cheese. 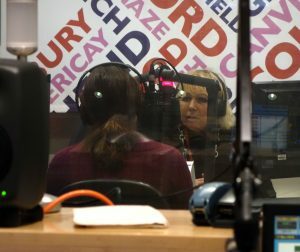 You can hear the show (7th May) on his BBC webpage for the next four of weeks, the main interview is about an hour and a quarter in. The coverage has been great and we have new followers, friends and enquiries already. Welcome to you all and thanks for the retweets. 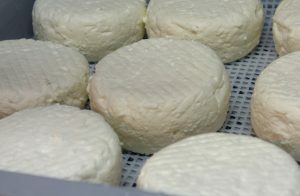 The batch of Chalvedon pictured on the BBC facebook page has now become the very first batch to go in our cold room to mature, we had the “grand” switching on this week. We also ventured to the West Midland to pick up the two tanks for the milk pasteurising plant. These will hold the milk once the pasteuriser and cream separator are up and running and are the first bits of kit to arrive. Fingers crossed for the rest to be here in July. Our pond has long been home to a collapsing, formerly floating duck house. 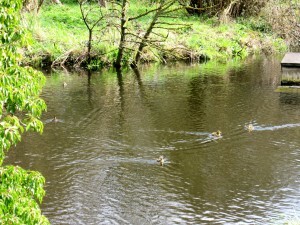 We are as a family rather fond of ducks (my nieces very favourite animal) and always love to see them on the pond. 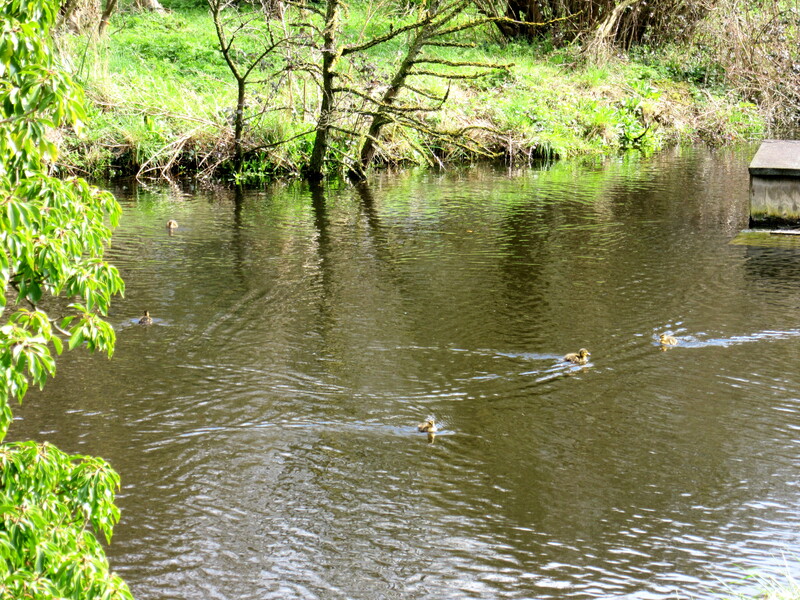 I wouldn’t like to say how many hours of mine and my sisters childhood were spent trying to get the ducks in to keep them safe overnight but we gave up the battle of pet ducks versus foxes many many years ago. 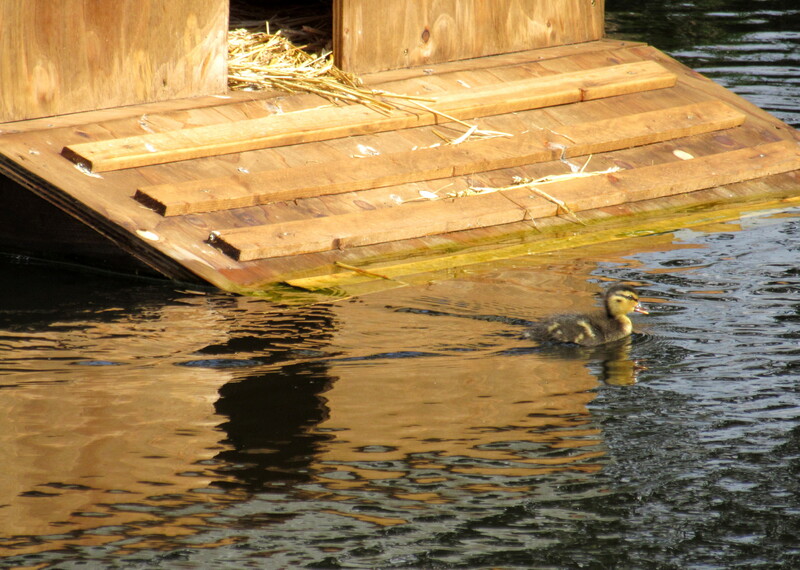 If they wanted to stay out all night at least we could give them somewhere safe for them to stay, and that was when the floating duck house was made. 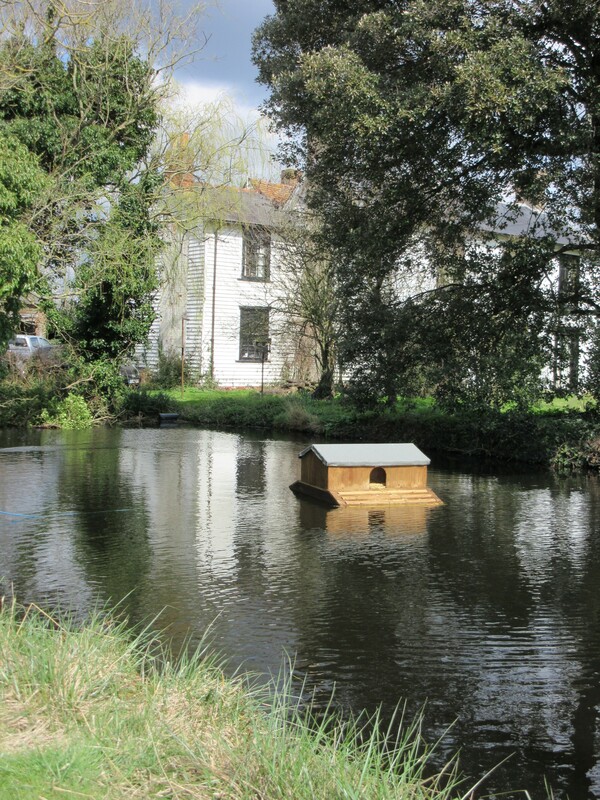 We have been thinking about doing something about the duck house for some time but despite its poor condition the duck house has been home to Mr and Mrs Moorhen for years. They usually produce two broods of black fluffy balls with long feet each year and we knew some were on the way as they had rather aggressively chased off the remaining offspring from last batch last month. So with Mrs Moorhen possibly nesting we couldn’t go near the old duck house so instead we finally got round to having a new one made. Launched with fingers crossed a few weeks ago it floated beautifully and has sat empty ever since. Mrs Moorhen emerged at the weekend with 4 of 5 (they are hard to spot sometimes) new babies and promptly re-located from old duck house to new which was lovely to see but more was yet to come. It appears that rather than desire to live in a new build she was escaping noisy neighbours, hidden away in the other half of the old duck house a wild Mallard was nesting too. She emerged briefly at the weekend with half a dozen cute ducklings, only to retreat back inside and come out today with more. 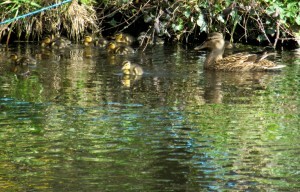 We think there are 18 baby mallards in total scooting around the pond in all directions with surprising bursts of speed. With two sets of parents as well the pond has never been so busy and there are quite literally babies everywhere you look. 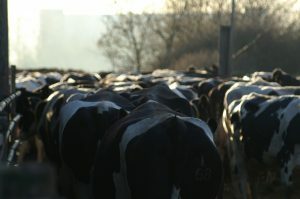 It has been quite a start to the year for dairy farming. Over the last 12 months we have all watched the wholesale milk prices plummet and it is still going down. Some farmers lost 3.5p a litre in a month and we have recently been issued with another 1.5p cut after a 1p cut last month. To put that in perspective every penny is worth £10,000 a year across the whole herd. But we are one of the lucky ones, some farmers don’t have a contract and have to rely on a straight market price which is much worse. So whilst we now lose money for every litre we produce we are not losing as much as some other people. 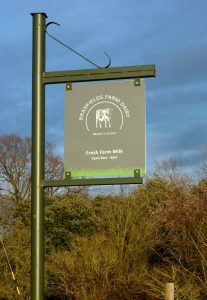 It is too much for many, another Essex dairy farm sold up last month and we have heard of another 4 or 5 going in east Anglia too. It is so sad to see the animals going, when you have spent your whole life building your herd and suddenly they have no value to anyone. There are lots of complicated reasons why the price has dropped and I am far from an expert in these but it seems a range of factors from international markets and demand changing. 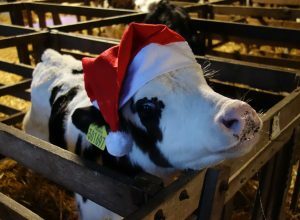 China started importing a lot as their economy grew and it is not so good now, I was told by someone Russia have stopped or reduced EU imports and at home some places sell milk as a loss leader for less than it costs to produce. In the better times some people expanded giving more supply and the problem with dairy is it is like turning a super tanker. You can’t just turn cows milk off or moth ball them until better times. The sad fact is that the market will rebalance as so many farms go out of dairy there will at some point be less supply and prices will rise again. The challenge is to keep going until we can break even again, and not be one of the ones going out. 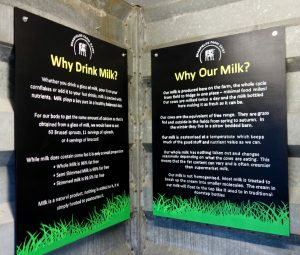 Our cows perform in the top 10% in the country so we can’t be much more efficient, we can’t scale up as we are a small farm surrounded by development so becoming more self sufficient and selling some of our milk direct is our only survival option. 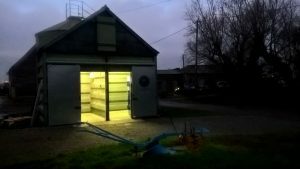 It wasn’t why we started the dairy, that was always for me to have a new role and come home to the farm but now it might be what helps us keep the cows in the fields. 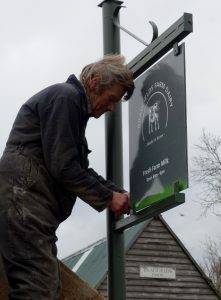 We hope to be selling some of our milk soon. So watch this space for further details.